The Book of the City of Ladies. The Lamentations of Matheolus in modern day is most famous for being the book that the allegorical Christine de Pizan picks up and reads at the beginning of the The Book of the City of Ladies. Considering it light reading, she saves it as a break away from her more difficult studies. As she progresses through it however, it ends up leaving her grief stricken and utterly ashamed as a female. Having read that the entirety of her gender is nothing more than the epitome of vile and wickedness, she questions how “such a worthy artisan would have deigned to make such an abominable work” (Pizan 5). Before Christine’s clever use of The Lamentations, however, it was infamous simply for its incredibly misogynistic overtones. Traditionally it was written in Latin by Mathieu of Bologne,also known as Matheolus in the late thirteenth century (White 141). He was a cleric who had married a widow and was considered a bigamist and therefore had a great deal of trouble obtaining preferment, that is to say he had a hard time raising his position or office. He considered his marriage to be the root cause for such misfortunes and he in turn wrote The Lamentations in response to it, complaining about marriage and women themselves. 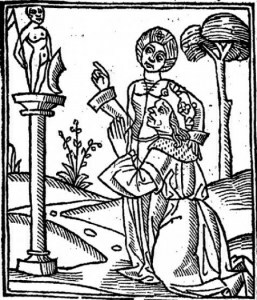 Through the use of satirization, Matheolus exaggerates all of women’s vices and uses it to devalue marriage. Oftentimes The Lamentations lingers on weakness of women, especially that women nag and can never keep a secret. The Lamentations has been infamous for centuries. While it may not have been widely used as a source for intellectual discussion or writing, there is no debating its incredible influence. Its author has since been renowned as a misogynist, and is consistently referred to as foolish throughout history. Preacher and theologist Jean Gerson simply referred to Matheolus as “le sot” or “the stupid one” (Burke 2). The power behind such a contemptuous work set in motion arguments about feminine rights and the value of women. What is so interesting about this is that he decided to translate the work at all. It is possible and seems likely that he initially began it just out of interest for financial gain. After he translated and wrote The Lamentations of Matheolus, he wrote a second book titled The Book of Gladness, in which he apologizes for ever having translated the original. It too was markedly successful and was continuously copied and printed up until the sixteenth century (Burke 1). In its pages are references to The Lamentations followed by arguments of why it is wrong and how women are respectable and good creatures. Matheolus’s influence reaches Christine on several fronts. Traditionally it is the very book that allegorical Christine picks up in The Book of the City of Ladies and sets in motion the entire events of the book. Its implications are outrageous and set allegorical Christine into a depressing frenzy of wondering why she was created to be such a monstrous creature. There is no question why Christine would choose such a work to begin her famous piece in defense of women. Not only was The Lamentations a perfect fit in that it dripped with misogyny, it was also fairly freshly translated and quite popular among society at the time. Her audience would know precisely which work she referenced and be more readily able to understand her arguments against it. Aside from the obvious, Matheolus’ influence also reached Christine on deeper levels. When Jean Le Fèvre translated the work (and profusely apologized for it with a second work), he set into motion part of the argumentative rebuttal against the notion that women were wicked. Christine of course was greatly against works that claimed that women were the epitome of evil and sin. Most famously, she argued against Roman de la Rose, and in her works that argued against it, such as Debating the Roman de la Rose, she frequently used Jean Le Fèvre’s Book of Gladness as a source (Blumenfeld-Kosinski 712). It is even noted that she used the work as a source for her Book of the City of Ladies (709). Le Fèvre’s work praises women and attempts to reconcile the slander against the entirety of the feminine gender, and had Matheolus not written Lamentations, Le Fèvre would never have inadvertently begun part of the argument surrounding women’s position in medieval life, and possibly in the far future influenced feminism. On that note, Matheolus’s eventual influence on Christine was twofold, where he criticized women he spurred in her the desire for a rebuttal, and where he troubled Jean Le Fèvre years down the road, he gave her a source to be used in support of her defense of women. To show why The Lamentations of Matheolus was such an outrageous piece of work and chosen as the prime example used to show why misogyny was out of place, examples and excerpts of the book must be shown. For example, Matheolus chose Roman de la Rose as a piece to uphold his arguments. Where Christine de Pizan began a fairly heated debated against Roman de la Rose, Matheolus took no time at all in incorporating the very same piece into his own work that slandered women and marriage. Where Christine argued that no person should read the work, Matheolus wished that he had read it much sooner so that he would not have married at all (Blumenfeld-Kosinski 712). 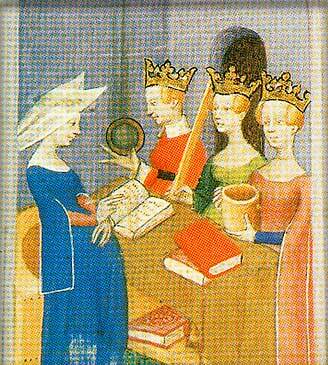 Christine argued that Roman de la Rose falsely portrayed women as vile. Matheolus openly embraced it and all it had to offer and used it as a direct source for slandering marriage. He thoroughly believes that by using noted figures of the past it will verify every bit of his writing. Matheolus does not hesitate to use famous examples, including that of Aristotle and Phyllis and in one part of his book he makes reference to God. The example of Aristotle is one where Aristotle encounters Phyllis, the wife of one of Aristotle’s pupils. 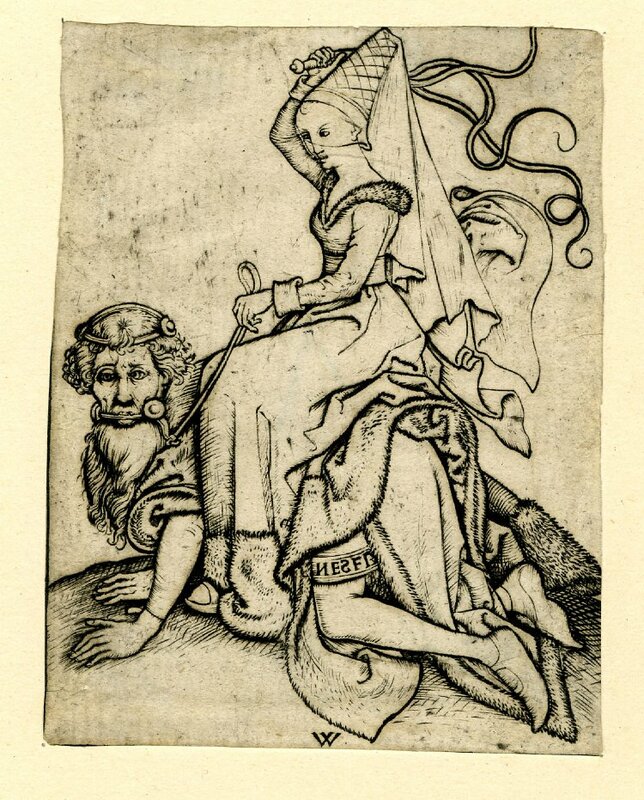 Having been offended by him and seeking revenge, she presents herself erotically to Aristotle and offers sexual favors, but only if he will allow her to ride him like a horse first (Rosenfeld 114). An outlandish example, it fits in with Matheolus’s motives perfectly. He argues that Aristotle was a great scholar who “fell” at the hands of a young seductress whose primary intent was to be nothing but wicked and bring down man (116). In a later part of the book Matheolus recounts a “true dream” where he appears before God and he is promised a place in heaven, and as he is now a martyr of marriage he will have a place among the most worthy, including bishops and monks (Blumenfeld-Kosinski 711). For Matheolus to reference the creator himself, and recount his experience as true, he is painstakingly taking every avenue to provide proof that his opinions about marriage are correct. Although the work is often considered a satire, its references to historical figures and otherworldly experiences seem to reinforce Matheolus’s intent of proving that marriage is the worst punishment for man and that women are nothing more than vessels for vice. Within his work he laments on women’s consistent nagging, complaining that they can never keep a secret, and that they are the bitter downfall of man. At one point he decrees that birds would stop singing before a woman could find a way to hold her tongue (theabsolute). Any number of excerpts from any part of Lamentations has the same negative effect. Reading through and realizing that Matheolus makes references to critical figures, it is apparent that he had every intention of persuading readers that marriage was a terrible torment. It only makes sense that Christine would choose such a work to start off her campaign in defending and educating women. There are obvious differences between Matheolus and Christine; they are polar opposites in their beliefs about marriage and the virtue of women. What is interesting are their parallels amongst similar topics. One of the most important parts of The Book of the City of Ladies is in Part I where Lady Reason begins discussing how wrong men are when describing women as wicked. Matheolus uses many renowned figures in his work, including Aristotle, Solomon, and even God himself. Christine uses Lady Reason to discuss how even learned men can be so wrong. To get the first distracting point out of the way, Lady Reason says she will “carry away the first basketful of dirt”, or in other words, will give light to the issue of how so many men could be so wrong in their presumptions (Pizan 16). She gives a multitude of reasons ranging from men being jealous of women to men simply enjoying the slander. Matheolus on the other hand never questions a person’s intent in his examples. Instead he uses whatever fits best and continues on. Christine, however, makes a logical argument that even renowned figures can be essentially wrong. Another striking difference is their approach and use of holy figures. Matheolus doesn’t hold back and includes a “dream” he had where God approached him and declared Matheolus a martyr because of marriage. He gives no logical argument and jumps right into a declaration of “because God said it, it must be true. Christine, however, is much more humble in her approach. She tactfully puts together a working allegory with three virtues that are sent to her by God. Instead of declaring that God approached her, she puts her allegorical self in a situation of distress that catches the attention of God. In response the three virtues are sent down to her and console her. His argument is extremely dogmatic and lacks any real logic. His Lamentations does include examples that he declares support his overall argument, but they are in nothing in comparison to Christine. Christine easily uses ten times the amount of examples to support her work than Matheolus. Each part of The Book of the City of Ladies is filled with numerous historical and respectable stories or examples that were carefully chosen based on how they would support her argument. Not only this, but she carefully devised a way to make her argument more approachable by presenting it as a story instead of a list of why everything was wrong.